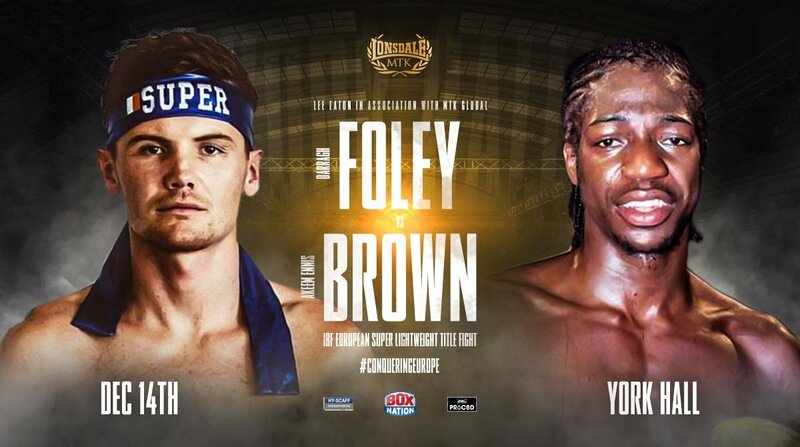 Darragh Foley faces Akeem Ennis Brown for the vacant IBF European super-lightweight at York Hall on December 14 following the withdrawal of Johnny Coyle. Irishman Foley (15-2-1-KO8), who trains under Tony Del Vecchio at the MTK Sydney facility in Australia, has a chance to showcase his talent at the iconic London venue live on BoxNation. Foley said: “There was no hesitation in taking this fight because six weeks is enough to prepare for any style. I’ve been in the gym for a good few weeks so I’m already in good shape. “His style is very unorthodox and awkward. This camp will be long enough to work him out. If he thinks he can fight me the way he’s been fighting other guys, he’s in for a shock. I’ve got respect for him though – he’s fought some good fighters and he’s still young. “Any time we go into a fight, we study the opponent, assess their weapons and then nullify them. He’s busy like a little ant but I’m pretty confident I’ll neutralize that with good thorough boxing and tactics. “I started off the year on a high getting to eighth in the world. After this fight I want to pick up that hunt for world titles. I respect that Akeem is trying to fight his way to the top too. This is about two avoided fighters going in there to face each other. A huge show in London sees three European titles contested on the night with Foley vs. Brown joining Luke Keeler’s WBO European middleweight title defence against Brian Rose and Larry Ekundayo’s IBF European welterweight defence against Louis Greene.